Amongst the most popular birthday cakes in India, this cake is all time favourite amongst kids. This cake looks incredibly gorgeous and isn’t half as difficult to make at home. On your kid’s birthday this year, be a star mom and make this cake at home. The original name of this popular German dessert is SchwarzwÃ¤lder Kirschtorte aka Black Forest cherry torte. It is known by different names in different parts of the world. In India, its popular as black forest cake, in the US, as black forest and in the UK, as black forest gateau. 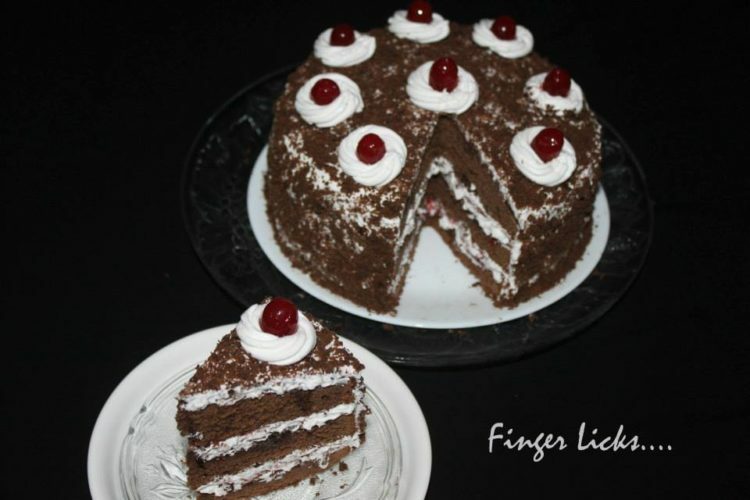 The authentic black forest cake is a multiple chocolate genoise layer cake which is soaked in Kirshwasser liqueur (a clear liqueur distilled from cherries) and covered with whipped cream and cherry filling. Believe me, this will be way better than store bought cake. As many of you thinking cake making is not that much hard compared when you compromise your kids health over fancy customised cakes bought from shops. This is the simple way of making the black forest cake even though it taste the same may be much better as we will be using the best for our kids. Right? I was the star mom for last birthday of my kid and I wish you should be too. The festive season is here and this is the best chance to hit a try. Mix sugar and water and bring to boil .boil it for 5 minutes to make a syrup. Preheat oven to 175 degrees Centigrade. Grease and flour two 9″ cake pans. In a large bowl, sieve the maida, cocoa powder, baking soda, baking powder and salt. Add the sugar and mix well with the dry ingredients. Make a well in the centre and add the milk, butter / oil, vanilla essence and beaten eggs and mix. Do not over mix. Pour the cake batter into the prepared cake pans and bake in the middle rack of the oven for 40 minutes or until a skewer comes out clean. Start checking from 35 minutes onwards.Trim the rounded top of the cake. While the cake is cooling, prepare the whipping cream. Place a very large bowl and beaters in the freezer for 15 minutes before beating the whipping cream. Beat with an electric mixer at high speed until stiff peaks form, approx 5-6 mts. Place the whipped cream in the fridge till you start assembling the cake. Chop cherries into small pieces and keep aside. Reserve some whole cherries for decoration. Cut both cake into 2 horizontally. Take one piece and crush it to make fine crumbs. keep aside. Take the next piece and brush it well with sugar syrup. Coat well. Take some whipping cream and cover the top . Put some chopped cherries on top.Now keep the 2nd piece on top do the same . Finally keep the 3rd piece . Brush with sugar syrup, cover the whole cake with whipped cream. Stick the cake crumbs on the side carefully. Decorate the top with cherries, whipping cream, and chocolate shavings. keep refrigerated at least 3 hours.